Go back to our nutritional roots with Bertyn seitan mince: honest, authentic. 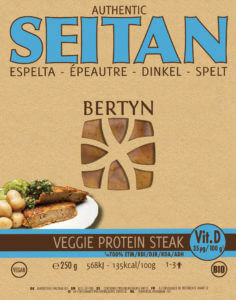 Our Bertyn seitan mince is a high-quality mince that, thanks to its versatility, is the perfect addition to any meal. Add spices and use in any dish you desire! Veggie Premium Mince find your fresh in the cooler of your health food store. 48% water, 25% whole grain wheat flour*, 25% wheat protein*, 2%: sea salt, leek powder*, pepper mix* (white*, black*, red pepper*, coriander*), nutmeg*. One pack of vegetarian mince contains 250 g and serves 1-3 persons. Keep away from light and chilled at 7° C maximum. Best before: see front packaging. Without: soya, flavorings, added sugars, sunflower oil, rapeseed oil, added (chemical) vitamins.